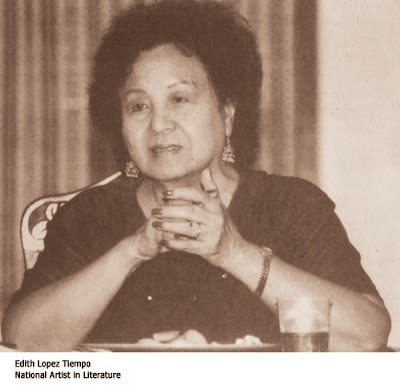 THE National Commission for Culture and the Arts (NCCA) and the Cultural Center of the Philippines (CCP) pay tribute to the late National Artist for Literature Edith Tiempo on September 7, 2011, Wednesday, 10am at the CCP Tanghalang Aurelio Tolentino (Little Theater). Necrological Rites for Tiempo were held in Dumaguete City last August 29. The event includes readings of poems, reminiscences, and music performances by friends of the late National Artist. A poet, teacher, fictionist and literary critic, Edith Tiempo was one of the finest writers in English in the country. Her works were characterized by a remarkable fusion of style and substance, of craftsmanship and insight. Her poems were intricate verbal transfigurations of significant experiences as shown in her much anthologized pieces, “The Littlest Marmoset” and “Bonsai”. She was an influential tradition in Philippine literature in English, where Filipino sensibility was fully expressed as exemplified in her Abide, Joshua and Other Stories (1992) and His Native Coast (1979) which won the CCP Award for the Novel. Together with her late husband Edilberto K. Tiempo, she founded and directed the Silliman National Writers Workshop in Dumaguete City, which until now, has trained and produced some of the country’s best creative writers in English. She was a recipient of several awards from the Don Carlos Palanca Memorial Awards for Literature and the Philippines Free Press literary contests and the Elizabeth Luce Moore Distinguished Asia Professor Award (1978) and has received grants and fellowships from Rockefeller Foundation, the Ford Foundation and the Asia Foundation. She was listed in the Princeton Encyclopedia of Poets and Poetics, the International Authors and Writers Who’s Who (Cambridge, 1977), the Contemporary Living Poets in the English Language (London) and the Marquis’ Who’s Who in the World (Philadelphia, 1998). Edith Tiempo was conferred the National Artist Award for Literature in 1999. 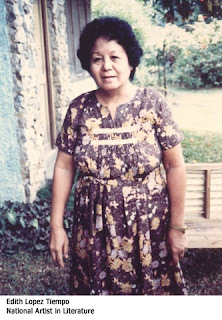 She is survived by son Maldon, daughter Rowena Tiempo-Torrevillas, son-in-law Lemuel and grandchildren.